The company offers the IntelliMine® suite of products, the MasterLink® wireless communications solutions, and its Performance Assurance Program to ensure every customer receives maximum, ongoing value-in-use from their Modular investments. Modular’s DISPATCH® fleet management system (FMS) introduced the concept of computerised dispatching to the mining industry. Today, surface mines of all size and type rely on the DISPATCH FMS to optimize their haulage cycles, maximize production, and increase equipment utilization. Considered the industry standard for fleet management systems, Modular’s customers have reported productivity improvements ranging from 5% to 34%, with an average improvement of 11%, for more than 35 years. Specifically designed to address the unique challenges of the underground mining environment, the DISPATCH Underground FMS automates all development and production processes, and supports all common underground mining methodologies. The DISPATCH Underground FMS gives mines the visibility they need to track, manage and efficiently utilize mobile equipment below the surface. The ProVision® machine guidance solution utilizes high-precision GPS technology to provide continuous navigation and guidance to equipment operators, increasing productivity and the realization of planned targets and tasks. The solution enables operators to position their buckets, blades and components to within 1cm of the intended location, resulting in decreased dirty loads, more accurate material blending, and more effective blasts. The ProVision solution is available for shovels, loaders, dozers, and drills. The MineAlert™ Collision Awareness system (CAS), an early warning system that alerts the equipment operator of potential collisions with other CAS-equipped vehicles, is designed to improve operator awareness and reduce vehicle-to-vehicle collisions. Predictive algorithms analyze the location, speed, and trajectory of all vehicles in the monitored vicinity and generate warnings and alarms only when hazardous or potentially hazardous conditions exist. Unlike other collision awareness systems on the market, Modular’s CAS focuses on minimizing false or nuisance alarms to provide operators with critical decision-making safety information only when it matters. The MineCare® maintenance management solution enables mines to increase fleet availability and uptime, while reducing mobile equipment lifecycle costs. The latest version of Modular’s real-time maintenance management product, MineCare Cloud, represents the company’s initial entry into the cloud-based, software-as-a-service (SaaS) market. The MineCare Cloud provides an alternative to the traditional on-site software installation model, which reduces costly capital expenses such as server hardware. While beneficial for mines of all size, the minimized IT infrastructure and support staff requirements make the MineCare Cloud solution an especially attractive option for smaller mines with limited budgets. The MasterLink® wireless communications solution provides fast, high-quality, low-maintenance communications for open-pit mining operations. Modular’s MasterLink Enterprise solution delivers maximum network capacity, seamless worksite mobility, enterprise level security and high-network availability. Since its introduction in 2015, numerous sites have reported positive results following the implementation of MasterLink Enterprise. In 1979, Modular released the DISPATCH fleet management system, marking the first computerized dispatching solution for the mining industry. Nearly four decades later, the company has expanded in size and capability, with more than 700 employees in ten countries, supporting all major mining locales. Modular’s systems are deployed at more than 250 globally-distributed sites, including 18 of the 20 largest mines in the world. Modular Mining, the global leader of real-time mine management solutions, announced today that Luiz Steinberg, President and Chief Executive Officer (CEO), will step down from the position on 31 March 2019. The Modular ProVision 3 Loader system enables loader operators to work efficiently and stick to the plan. The DISPATCH® system is the most trusted fleet management solution in the mining industry today. As Modular’s flagship product, the DISPATCH Fleet Management System enables you to implement specific production strategies using an extensive set of mining tools. The MineCare® solution improves every aspect of the maintenance management process, providing the information and tools you need to monitor the health of your entire fleet in real-time. For more than 15 years, mines around the world have used ProVision® machine guidance solutions to increase their total tons moved, improve the accuracy of material movement, and decrease costs associated with working outside of the mine plan. The DISPATCH® Underground system delivers unparalleled mine management from the production face to the central office, and all points in between, to provide the most effective end-to-end solution for greater efficiency, productivity, and safety of underground operations. Modular’s Collision Awareness System, an integral part of our MineAlert™ suite of Safety Management tools, helps your people make the right decisions at the right time. The DISPATCH mine management solution, available for surface mines, allows customers to implement specific production strategies using an extensive set of mining tools. IntelliMine is the mining industry’s solution of choice, with over 250 deployments worldwide, supported by over 625 dedicated employees, in more than 30 countries. 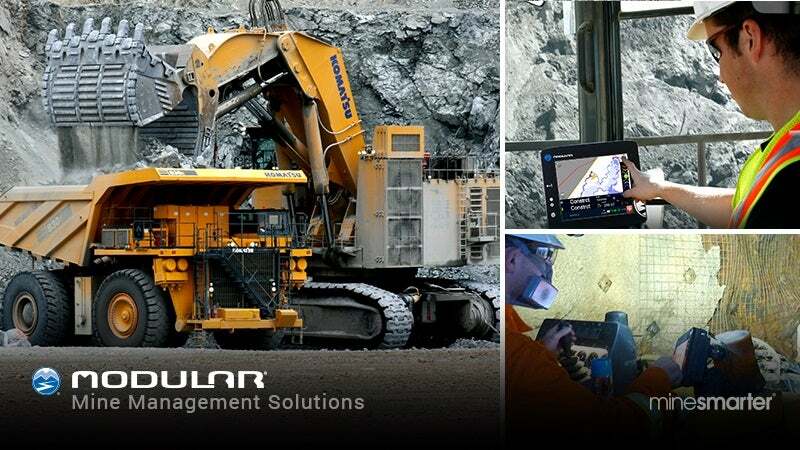 Modular implemented the DISPATCH FMS at Grib mine in 2015, thus enabling the mine to maximize the load of its excavator fleet and improve overall equipment utilization. Long-time customer Drummond Ltd. Colombia sought Modular’s help in reducing the amount of time wasted during the two daily shift changes at their Mina Pribbenow and Mina El Descanso sites. Modular Mining is to hold a presentation at the forthcoming SME 2019 Conference & Expo. Long-time customer Drummond Ltd. Colombia sought Modular’s help in reducing the amount of time wasted during the two daily shift changes at their Mina Pribbenow and Mina El Descanso sites. Despite extensive experience using the DISPATCH Fleet Management system (FMS), Drummond’s shift changes frequently took up to an hour to complete. Modular Mining Systems, the global leader in real-time mine management solutions, today announced its fourth-generation collision awareness system (CAS) to feature key technologies from DENSO.